Credit unions and other cooperatives can work together for their mutual benefit, according to panelists at the Minnesota Credit Union Networks annual meeting. From left, cooperative consultant Adam Schwartz, SPIRE FCU President/CEO Dan Stoltz, The Wedge General Manager Lindy Bannister, Crow Wing Power CU Vice President Diane Viehauser and CUNA President/CEO Bill Cheney. 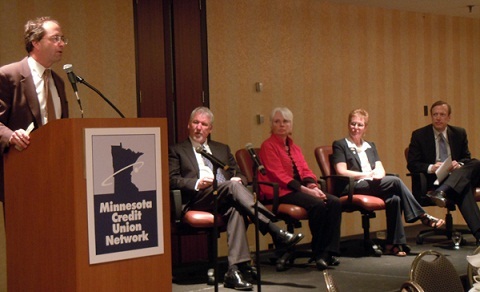 Credit unions and other cooperatives can work together for their mutual benefit, according to panelists at a session at the Minnesota Credit Union Network’s annual meeting.